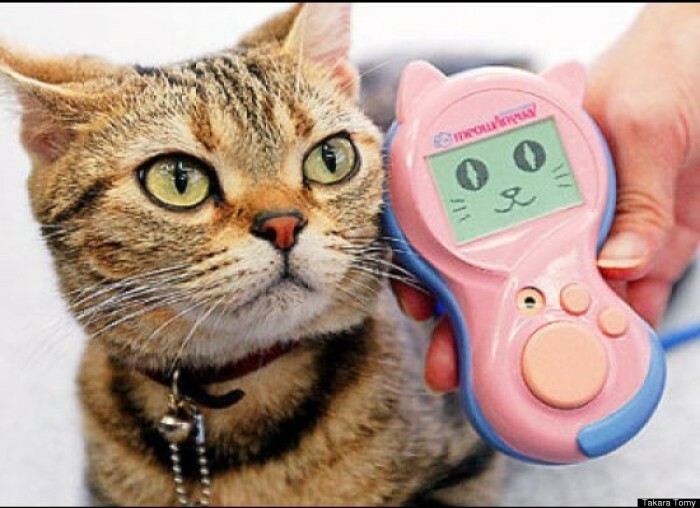 Like Takara Tomy’s Bowlingual, the dog “translator” device, the Meowlingual will help you decode what your cat is telling you. It can analyze the expression on your feline friend’s furry face and categorize it into six different moods. The gadget also translates around 200 words in “cat chat”. It can even interpret 21 kinds of emotions based on your cats gestures and behavior, and offers 85 types of health checks. The BowLingual translator promised to bridge the communications gap between humans and dogs. But since a wagging tail and shredded toilet paper make it easy to figure out what a dog is thinking, it wasn’t exactly a must-have gadget. Cats, on the other hand? That’s a different story. Often, you’re never sure which of your many infractions has caused your cats to shred the furniture, poop on your bed, or spray the living room. So the Meowlingual translator seems like an essential tool if dogs aren’t your thing and goldfish seem pointless. Not only is it supposedly able to analyze the expression on a cat’s face and categorize it into one of six different moods, the Meowlingual can also translate somewhere around 200 words by listening to meows, and recognize 21 different emotions based on how your cat moves and behaves. The device is making some grandioise claims and for $169, shipped from Japan, it better deliver. But even if it’s only right two percent of the time, it’s probably still worth every penny. This entry was tagged cat, inovation, language, sci-fi, science, tech, translate.